A Spotify ad has been banned for "unjustifiably" distressing children. In its ruling, the Advertising Standards Authority (ASA) said the setting and events were "particularly likely" to scare younger viewers. In a statement, Spotify said: "We acknowledge the ruling from the ASA and regret any distress the ad may have caused the complainant." The ASA has also banned an ad for breast enlargement which was shown during ITV's Love Island. 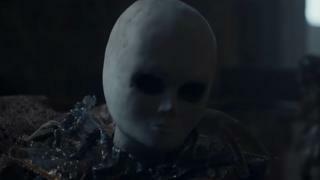 The video shows the music also waking a "horror film style doll" that then pops up and scares the characters every time the track is played. And the ASA upheld both of these complaints "in part". "The fact that the ad was set inside a home, including a bedtime setting, and featured a doll, meant it was particularly likely to cause distress to children who saw it," it said in its ruling. The soundtrack helped establish it was intended to be "tongue-in-cheek". And the on-screen text used to close the ad - "Killer songs you can't resist" - helped reinforce its intent to make a spoof rather than a clip that was genuinely scary. After the ruling, it said: "We take our responsibilities as a marketer very seriously and continue to be mindful of the ASA's guidance on the effective and appropriate targeting of advertising campaigns."